Asian dog is a great guard dog, he is strong and brave, devoted and faithful to his owner. It is not possible to lie to him or to bribe. 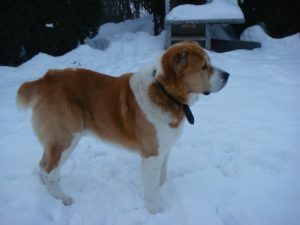 He has already been born with his guarding endowments as a shepherd dog, which oversees his pack the night and the day. It is not possible to surprise him by anything, he is sturdy and slow, but if it is necessary he can react to danger very quickly. He is very distrustful of unknown people, but he loves by his pack headlong. This breed needs hard hand particularly when he is puppy but when somebody works with him he is very skillful.